"The FA Cup final? A no-brainer - Liverpool v Arsenal. 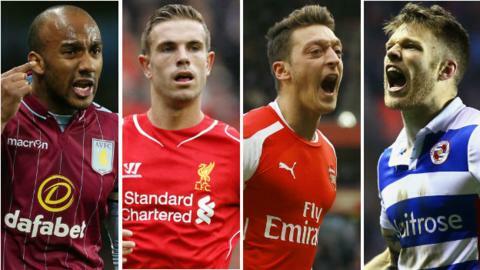 "Their semi-final opponents - Aston Villa and Reading - are last-four fodder for the big boys." History shows that when underdogs rub up against more celebrated names - with the final just an upset away - you can expect anything but the routine. To whet the appetite, we roll the clock back to six FA Cup semi-finals where the form book was thrillingly shredded. Few people outside the red and white clad parts of the north east knew much about the 1972-73 season's surprise FA Cup semi-finalists Sunderland, beyond the fact that their manager Bob Stokoe wore a hat. After all, Sunderland had not been in an FA Cup semi-final in 16 seasons and had only won one match in the competition in the five campaigns before 1972-73. By contrast, Bertie Mee's Arsenal, four-time FA Cup winners, were targeting a third successive trip to Wembley. But Stokoe and his men were not prepared to wilt in their newly found limelight and took to their task on a muddy pitch in Sheffield with an intensity and determination that the Gunners couldn't match. Vic Halom pounced on a weak backpass from Geoff Blockley to open the scoring before Billy Hughes doubled the lead with a looping header. Charlie George gave Arsenal hope, but it was too little too late. At the final whistle, Stokoe was mobbed by players, fans and photographers. The only thing unmoved was his trademark trilby. "Nobody outside Wearside could have expected us to lose to Sunderland in the semi-final at Hillsborough. They were nothing more than a middle-to-average sort of Second Division side." - Arsenal midfielder Peter Storey. What happened in the final? Sunderland's players - particularly final goal-scorer Ian Porterfield and goalkeeper Jim Montgomery, who pulled off a stunning double save to deny Trevor Cherry and then Peter Lorimer - became household names by beating holders Leeds at Wembley to become the first team from outside the top division to win the FA Cup in 40 years. United States President Richard Nixon announced that a peace accord has been reached to end the war in Vietnam. The 9-0 pasting handed out by Liverpool at Anfield in September 1989 remains Crystal Palace's heaviest league defeat. Seven months later, against the same opposition, came one of their most famous victories. In front of a crowd that shook the cobwebs off Villa Park, Liverpool led 3-2 with five minutes to go. But their defence, led by Alan Hansen, always looked vulnerable to Palace's physicality and aerial threat. Andy Gray equalised with three minutes to go, team-mate Andy Thorn hit the crossbar in injury-time and, in extra time, Alan Pardew buried a third header to Red disbelief and Eagles delirium. Palace chairman Ron Noades dived into the team bath to celebrate with his players. "The team with the best players don't always win a semi-final. It's a one-off. Sometimes character, determination, guts and passion are more important than skill." - Crystal Palace manager Steve Coppell. Although they lost to Manchester United in the final, Palace survived their first season back in the top flight, finishing 15th. Home Alone dominated the cinema box office in a year which also saw the release of Pretty Woman, Die Hard 2 and Rocky V.
Frank Lampard Jr has scored his share of FA Cup semi-final goals for Chelsea, but 35 years ago it was Frank Lampard Sr, the father of the current Manchester City midfielder, who was making his mark on a last-four contest. Lampard Sr's decisive contribution to the semi-final replay against Everton at Elland Road on 16 April 1980 has gone down in Hammers folklore, as much for the bearded left-back's celebration as the moment that provoked it. The goal - a diving header inside the box following a flick-on from David Cross - came two minutes from the end of an extra-time period that had already seen Bob Latchford cancel out Alan Devonshire's opener for United. This season has seen a number of FA Cup shocks, with three coming on the same day. League One Bradford came back from 2-0 down to beat Premier League leaders Chelsea 4-2 at Stamford Bridge as Championship side Middlesbrough won 2-0 at the home of top-flight champions Manchester City. Earlier in the day, second-tier Blackburn achieved a 3-2 victory at Swansea. Lampard Sr's reaction showcased the kind of unhinged jubilance associated with the FA Cup as he charged over and danced rings round the corner flag, with his team-mates descending on him. The goal (one of only 18 he scored in 551 games for the club) sent Second Division West Ham through to the final and was subsequently immortalised in song on the terraces at Upton Park. "I don't know what I was doing up there, but I'll settle for it," - West Ham matchwinner Frank Lampard Sr.
From one memorable header to another... West Ham legend Trevor Brooking scored arguably his most famous Hammers goal as he stooped down low to deflect Stuart Pearson's drive into the net to give his side a 1-0 win against Arsenal in the final. The United States Olympic hockey team, made up of amateur and collegiate players, beat six-time gold medallists the Soviet Union in the semi-finals of the Winter Olympics - a match later dubbed the "Miracle on Ice". Signed from Inter Milan in January 1997, Gianluca Festa, pictured scoring against Chesterfield, stayed with Boro despite their relegation from the top flight. As the Premier League money-making machine clicked into gear in the mid-1990s, Middlesbrough emerged as a stopping post for some of the world's most sought-after talent. Brazil international Juninho shared midfield with Robbie Mustoe. Fabrizio Ravanelli, fresh from scoring in Juventus's Champions League final win, found himself lining up alongside Phil Stamp. Yet Chesterfield, in the third tier and assembled for a total of £320,000, very nearly derailed the Teessiders' march towards a first FA Cup final. Leading 2-1 with 21 minutes of normal time to go and a man's advantage, the Spireites' Jonathan Howard swivelled and crashed a shot past Boro goalkeeper Ben Roberts. The ball cannoned down off the crossbar and bounced up and out. Referee David Elleray blew up - but for a foul against a Chesterfield player attempting to reach the rebound rather than the goal that replays showed should have stood. Craig Hignett converted a questionable penalty to level and Gianluca Festa's extra-time goal seemed set to send Boro through, but, just as the Chesterfield fans were starting a philosophical chant of "We're proud of you", hometown boy Jamie Hewitt guided home a header from a skidding Chris Beaumont cross. The replay failed to live up to the thriller that had gone before with Boro winning 3-0. "It actually hurts more as the years go by," - Chesterfield's Jamie Hewitt reflecting on Jonathan Howard's goal that never was. Middlesbrough lost 2-0 to Chelsea in the final - their second cup final defeat of the season, after losing to Leicester in the League Cup. Cuba Gooding Jr won Best Supporting Actor at the Academy Awards for his role as Rod Tidwell in Jerry Maguire. Similarly Scottish, steeped in the club's bootroom tradition and a winner of three titles during his time at Rangers, Graeme Souness was seen as the perfect successor to Kenny Dalglish at Liverpool. But an injury-prone squad was showing its age and the FA Cup soon became his only realistic hope of silverware in his first full season in charge. Second-tier Portsmouth, fresh from turning over Nottingham Forest, created the better chances at Highbury and, deep into extra time, finally got the goal they deserved. Twenty-year-old prospect Darren Anderton hared onto Warren Neill's long ball and blasted a shot through Bruce Grobbelaar's grasp. Pompey had nine minutes to hang on, but were undone in agonising fashion as John Barnes's free-kick came off the post and, with goalkeeper Alan Knight stranded, Ronnie Whelan poked in. The teams could not be split during a goalless Villa Park replay and, after four hours of football, the match became the first FA Cup semi-final to be settled on penalties - Liverpool winning the shootout 3-1. "It was more exciting than roast beef and Yorkshire pudding, but mostly rubbish. Exciting rubbish, but rubbish nonetheless." - Daily Mail journalist Jeff Powell. Liverpool beat more second-tier opposition - in the shape of Sunderland - to lift the Cup. The European Championship was won by Denmark, who had qualified only as a result of the breakup and warfare in Yugoslavia, which prevented their involvement. Joe Royle described 1989-90 as Oldham's "pinch-me season", such was the number of times they had to make sure they weren't dreaming. That season, the Second Division Latics reached the League Cup final, fell just short of the play-offs and narrowly lost out to Manchester United in a classic two-game Lancastrian FA Cup semi-final tussle. In contrast to Royle, Alex Ferguson was living by the skin of his teeth at Manchester United. Trophyless in three seasons and under extreme pressure, it is now established in the Ferguson mythology that had Mark Robins's goal not won a third-round tie at Nottingham Forest that year, the future most successful manager in British history would have been sacked. In the first game, the teams could not be separated at the end of either 90 or 120 minutes, as they shared six goals over the course of a gruelling see-saw encounter at Maine Road. Three days later, after Oldham's Andy Ritchie had cancelled out Brian McClair's opener to send the second game to an extra 30 minutes, Ferguson and United were again indebted to youth product Robins, whose low shot settled the tie once and for all. United would go on to beat Crystal Palace in a final replay, thanks to Lee Martin's only goal, to give Ferguson the first of 38 trophies as Red Devils boss. World heavyweight champion Mike Tyson was sensationally knocked out by 42-1 outsider James "Buster" Douglas in Tokyo.